Graphic Novel Review 29/365: Nanjing The Burning City – Dark Horse Week! 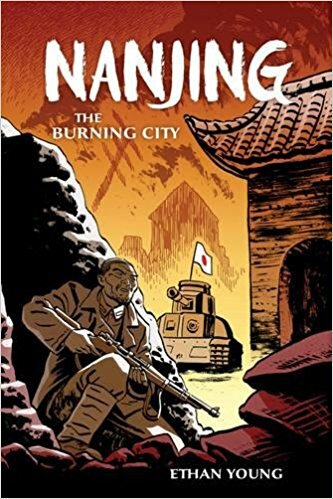 Dark Horse Week continues with Ethan Young’s powerful story, Nanjing The Burning City. In December of 1937, during the second Sino-Japanese War, Japanese forces captured the city of Nanjing. Chinese commanders fled, abandoning their soldiers and leaving them exposed to the inevitable onslaught of the Japanese soldiers. 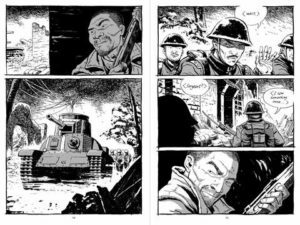 Award-winning author/artist Ethan Young brings us a tale of two of these Chinese soldiers attempting to survive the chaotic, war-torn streets of Nanjing while attempting to maintain a level of humanity. They encounter hungry citizens, homeless children, enemy forces, and many difficult decisions. Ethan Young does not shy away from grueling circumstances, leaving this book with a 17+ rating. War is hell, and the situations developed in Nanjing The Burning City will not leave you feeling satisfied, and they shouldn’t. There is no glorification of violence, weaponry, or conflict in this book. I will not spoil anything by alluding to who lives or dies because I want you to develop your own relationship with all of the characters, but I am interested in your thoughts as to how Young lets the story develop from beginning to end. And while I feel that this book could have been longer to play out more of the characterization, the story/character arc is enough to take you on a journey through Nanjing, and it will stay with you. The book is delivered to us in a simple black/white/gray color scheme, and while many black/white/gray graphic novels can confuse the reader as to what is going on and often create confusing character designs, Ethan brilliantly crafts this work with no confusion, and the back matter of the novel does an excellent job of discussing Young’s creation process…some of the best back matter I’ve covered so far in this 365 process: it’s not too much, and it does exactly what it needs to. Last year, my students told me that they wanted more war and sports graphic novels on my classroom shelf. I’m happy to add this title to my collection of classroom titles, and I’m interested in the discussions that it will create.